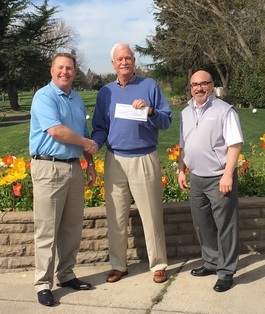 Kevin Wolf, Men’s Group leader and Ernie Micelli, club manager of the Woodbridge Golf and Country Club, presented a check for the second year in a row to the Foundation for support of cancer treatment. The Men’s Group collects funds from its membership to support an organization in the community that deals with cancer and cancer victims. These funds will be used in the hospital Palliative Care Program in which a number of seniors battle various forms of life-shortening cancer. Thank you to all of the Men’s Group members for their support.